I was born in Dubois, Pennsylvania in 1958 and raised in Brockway, Pennsylvania. My brother Ron and I grew up in the country and we were always dragging home some type of critter. Whether it was a Ground Hog, Bunny Rabbit, Snake, Turkey or the neighbors’ dog, animals have always been a part of my life. Ron and I would spend Hours going into the woods with 5 gallon buckets to pick Blackberries. We would see Deer, Bear, Foxes, Raccoons and then I would look into the Sky and just be fascinated by soaring Vultures or a Red-tailed Hawk diving to the earth to snag a mouse that only he could see. We would see Bald Eagles in trees by the creek just wishing it would let us get closer. Ron and I would dam up small creeks and put hooks on strings and spend the afternoon fishing. After graduating from High School in 1976 I accepted a Football scholarship from Southwestern College in Winfield, Kansas. Thus began my relationship with the wonderful state I now call home. After two years of college I needed to find work to help pay my living and college expenses. Back in the 70”S scholarships only paid for part of your tuition, books, and room and board. After working from job to job, I ended up working for the U.S. Postal Service in 1984 as a casual employee. I made it a career in 1985 and worked at the general Mail facility where I met my wonderful wife Susan. After chasing her for what seemed like forever she finally relented and we went on a date in 1987. We married in 1992. I played softball and restored cars, but my love and interest was always in animals. I started volunteering at private zoos, and worked with tigers, lions, leopards, bears, lemurs, Zebra, Giraffes, Elk and many other types of exotic animals. When I had the opportunity to work with injured and orphaned Owls I was hooked. Susan took the initiative and started volunteering at area rehab facilities and I kind of followed along. After she received her IWRC certification, permits from the U.S. Fish & Wildlife Service and the Kansas Department of Wildlife and Parks, we built our 1st pen at our Wichita home and received an injured Barred Owl in 1998. In 1999 I made a major change in my life and took a position with Tanganyika Wildlife Park in Goddard, Kansas and gave up my Postal Career. I became the head keeper there and among many of my duties I became the Tour Guide where I have met many fine teachers, scout leaders, 4-H and church groups that give kids an opportunity to learn about animals. 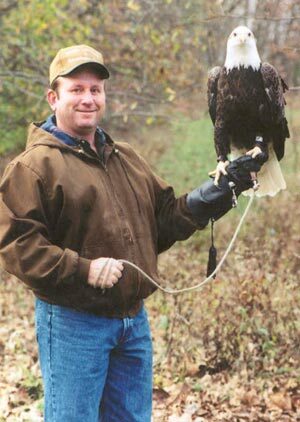 In 2000 I went to the World Bird Sanctuary in St. Louis and trained on all aspects of rehabbing and exhibiting Birds Of Prey. In 2001 I took and received my certification from the International World Rehabilitation Council’s (IWRC) class on basic rehab at the Rolling Hills Zoo in Salina, Kansas. I was then added as a sub permittee on our Rehabilitation and Exhibition Permits. Since that time we have added many non-releasable birds to our extended family. After leaving Tanganyika in the winter of 2003, I along with my brother Ron (who came in from Pennsylvania not once but twice to help build our pens) started Eagle Valley Raptor Center. Teaching about these wonderful animals is now one of the joys in my life and I would like to be able to share that with our community for years to come.